After episode 27 went to great lengths to remind us just how insanely complicated the current situation is, none of those threads have been untangled one bit. Let's take a moment to recap the last three episodes. In episode 30, a new character was introduced, throwing a massive wrench into everyone's plans. In episode 31, we saw something called a phase warp and got a needed reminder that the Dark Ocean is still around waiting to consume susceptible children. Episode 32 introduces the destiny stones, and all we know about them is that bad things happen when they go kablooey. Anything clarified in this episode? Nope! Just some more new concepts, a couple theories and another destiny stone going kablooey. At least it's presented well. It's eggheads on parade today, but at least their conversations are far more intelligent and intriguing than the one BlackWargreymon and Agumon had. In particular, the chat between Ken and Izzy felt like a meeting of the minds... as in they play a game of theoreticist tennis that ends up being less about helping Ken and more about Izzy's need to school the new kid. I didn't think Izzy was capable of looking that smug. Izzy posits the theory that certain elements in the Digital World appear based on subconscious desires, such as the upgraded digivices and downgraded outfits. It explains a lot, and ends up being the foundation of the season's climax. It also raises a whole bunch of new questions. Why was this never a factor in the first season? Why hasn't their subconscious desires yielded anything useful other than the digivices? Perhaps the most troublesome of all comes from the fact that Davis, Yolei and Cody weren't in the Digital World when they got their digivices: they received them when Tai contacted the digiegg of Courage. Does this mean hooking up those three came about because of Tai's subconscious desire to let someone else handle this? The other big can of worms is the disruption between the two worlds when a destiny stone is destroyed. After destroying one, BlackWargreymon leads a parade of other Digimon through Kyoto... sort of. They materialize for a few minutes before returning... unless one's in a fighting mood. Then they break through for real. It's good to generate some action, but doesn't really make any sense. It makes even less sense that Ken and Stingmon are able to use this disruption to show up in Kyoto for reals, beat up an Apemon and drag him back home. 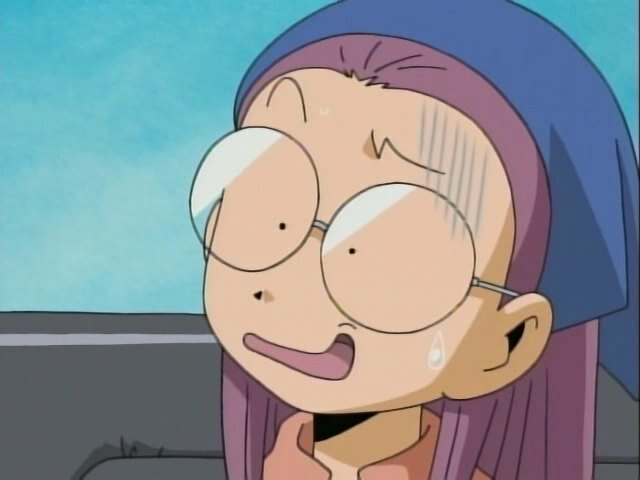 All of this happens in front of Yolei, who was probably supposed to be the central character but spends most of the episode looking slack-jawed and confused by the unfolding events. 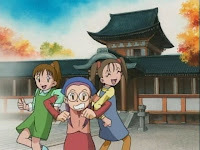 It doesn't help that following Ken's cameo, Sora's father and Joe's brother show up and change the subject completely, being less interested in the threat of rampaging monsters and more interested in the mythological origins of Digimon and their connection to Kyoto, Japan's corner penthouse of spook central. It's a good thing all of this stuff is interesting. 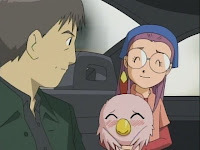 The trip to Kyoto is a nice change of scenery, the mythology lesson is insightful and the concept of Digimon being based off of legends is a nice way to reflect what the show's creators have basically been doing all along. While what actually transpires makes almost no sense and digs the season further into the hole, at least it's a fun descent. And not a damn word about Joe's two brothers being consolidated into one for the dub. This season has too many peripheral characters already. Yolei's friend on the trip bears an uncanny resemblance to Jeri from Tamers. Strangely, this is neither the first nor the last Jeri doppleganger we see in the first two seasons. One of Mimi's friends in episode 29 of season one also looks like her, as does Izzy's daughter in the epilogue. That last one would make for a great plot twist in a fanfic! Izzy's effort to cheer up Ken involves assuring him that everybody has made mistakes in the past. His personal example is that some of his theories weren't true, but he doesn't go into details on which ones or how they actually constituted a costly mistake. It's not like his “everything is aliens” theory early in season one did any real harm. 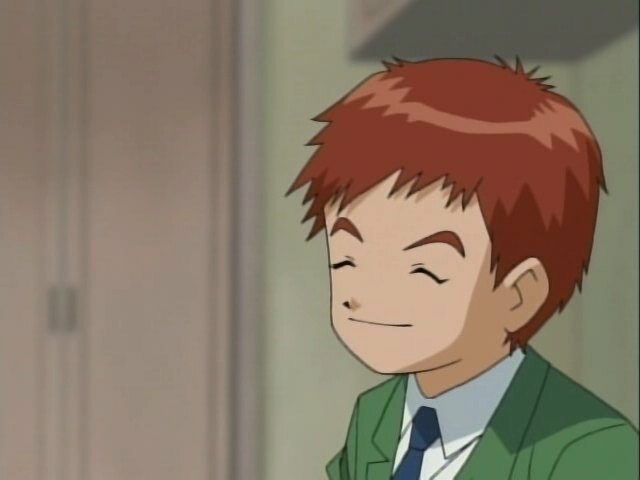 It's a little unsettling how nonchalant Prof. Takenouchi is about admitting that he is an awful father to Sora. He even says he had attributed Sora's reconciliation with her mother to either a boyfriend or a teenage phase. Those are reasons for girls to rebel against their parents, not get closer! And what father would be comfortable with their twelve-year-old daughter having a boyfriend? Actually, Sora is fourteen in the original and fifteen in the dub by now; she was eleven during the events of the first season. The context of the conversation sounded like it was referring to Sora immediately after the first season. I hope I'm wrong. Honestly all this episode did was confuse the heck out of me. If the barriers between the world were weak already way didn't any digimon show up on earth until a very digi Christmas?